CHAPEL HILL, N.C., Oct 24, 2018 (SEND2PRESS NEWSWIRE) -- University Kia and Meals on Wheels Chapel Hill-Carrboro are joining forces to help feed the elderly and homebound in the Chapel Hill-Carrboro area. With the generous donation of a New 2019 Kia Soul by University Kia, Meals on Wheels Chapel Hill-Carrboro will be able to continue to provide hot, nutritious meals and personal visits to more than 180 recipients in the Chapel Hill, Carrboro, and southern Orange County areas who are unable to prepare meals for themselves. 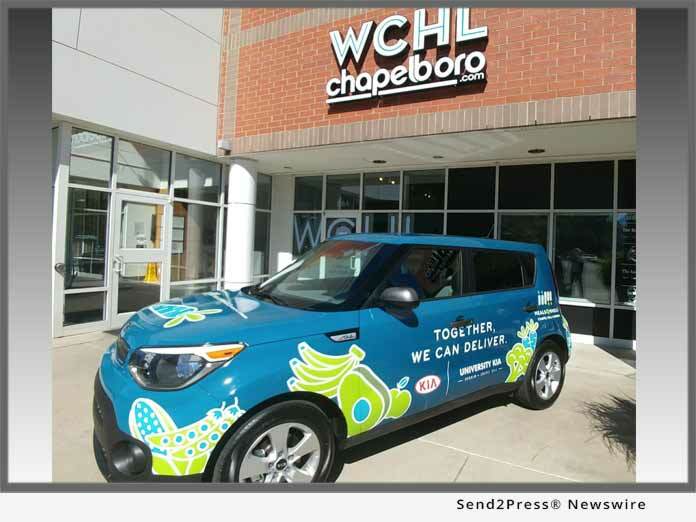 "We are so grateful for University Kia's partnership and their generous donation of a KIA Soul," said Rachel Sobel Bearman, Executive Director, Meals on Wheels Chapel Hill-Carrboro. "CHCMOW is dependent on our amazing army of volunteers and our giving community to be able to bring food and a human connection to the elderly and homebound. With this donation University KIA is helping to not only bring attention to often isolated and forgotten members of our community, but joy and recognition to our volunteers." University Kia, currently located in the heart of Durham, will be moving to a new location closer to the Chapel Hill area in the next few months. "With our store moving closer to Chapel Hill, we decided to partner with Meals on Wheels," said University Kia's General Manager, Aric Swanger. "We were able to donate the New 2019 Kia Soul to the program and we even had it custom vinyl wrapped so that it would stand out when people see it on the street. We are hoping that this raises awareness for the good that Meals on Wheels is doing for the Chapel Hill and Carrboro communities. We also could not have done this venture without the help of WCHL radio in Chapel Hill, which is promoting the University Kia Meals on Wheels Soul." For more information on Meals on Wheels Chapel Hill-Carrboro or to volunteer, please visit https://www.chcmow.org. For more information on University Kia, please visit https://universitykiaofdurham.com. University Auto Group has been serving the Triangle for over 30 years. Since inception, University Kia has made its mission to provide outstanding customer service and to create a one-of-a-kind car buying experience. In an industry that is ever-changing, University Kia remains committed its customers, staff, and communities it serves.